The Hofstra Law Mock Trial team of Stephen Boniberger 2L, Scott Migden 2L, C. Nneka Nzekwu 3L and Michael Santos 1L was a semifinalist in New York Regional of the American Association for Justice 2016 Student Trial Advocacy Competition (AAJ-STAC). The event was held in New York City on March 11-13. 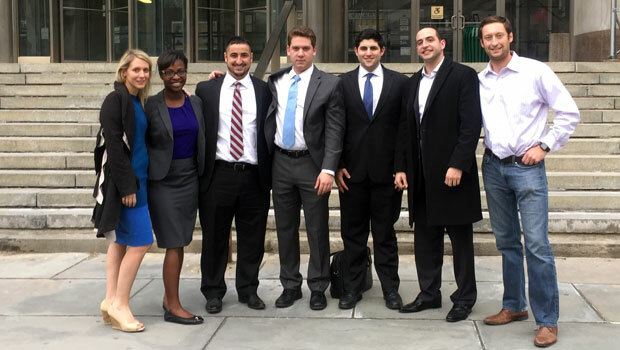 The Hofstra Law team faced Brooklyn Law School, NYU School of Law and Syracuse University College of Law in the preliminary rounds, winning every one and advancing to the semifinal round. There, the team faced Fordham University School of Law and, in a split vote by the judges, missed the finals by one point. The team was coached by Jennifer Camillo, Dmitriy Chernyy, Jana McNulty ’14, Alexi Poulianos ’11 and Jared Rosenblatt ’03. Judge Arthur Diamond ’78 and Phil Nash ’13 also evaluated and advised the team. The AAJ Student Trial Advocacy Competition is one of two premier national trial competitions, with more than 225 law schools from across the country competing.